Karenlovesraw: Banana on toast - only much better for you! Snacks are something that a lot of people wanting to be healthy struggle with. Everyone needs a little enjoyment between meals that will keep you sustained and energised as well as mentally satisfied. Here is a quick easy treat that you can have anywhere in no time at all. This recipe is what inspired me to make the 4 seeds crackers. There are so many savoury raw crackers but none are neutral! Like bread, do what you want with it!! Whatever you can do with bread you can do with our 4-seed crackers – except roll them up!! I wanted something that would satisfy those quick sweet snacks like honey and jam on bread. This is also great because it is gluten free, grain free, dairy free with no additives or flavours at all, not even salt! · Pizza base – little ones!! And that’s just of the top of my head while I type this up. Pepitas – for zinc, iron, magnesium, protein and tryptophan.. to help you stay happy! Good for combating prostate cancer and they are anti-inflammatory which is good for everything including arthritis? Sunflower seeds – Vitamin E, selenium and folate.. all great for female health including hormones and gorgeous skin. Also heart health, hot flushes and they are anti-inflammatory. Flaxseeds – Omega 3!! Need I say anymore. Plus lignans for digestive and heart health and fiber. Chia seeds – another omega-3 hit, antioxidants, fiber, calcium and protein. 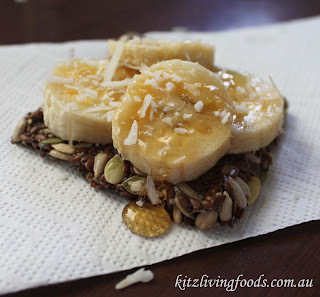 Simple, just add sliced banana, raw honey and a sprinkle of fresh or organic dried coconut to a Kitz 4-seed cracker. Enjoy!